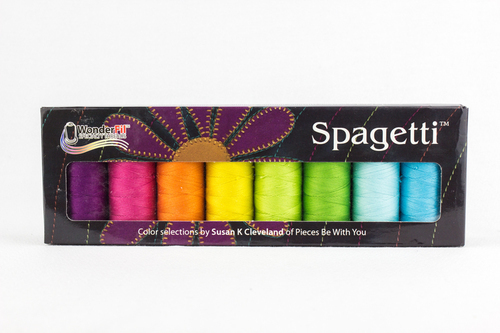 Spagetti™ is now available in five gorgeous thread pack sets! With colours selected by Susan Cleveland, quilt designer, author and teacher, theses Spagetti™ packs are guaranteed to make a beautiful impression on any project. Each pack comes with 8 spools of our 12wt 100% Egyptian Cotton Spagetti™ thread which is recommended for quilting, decorative stitching and topstitching.